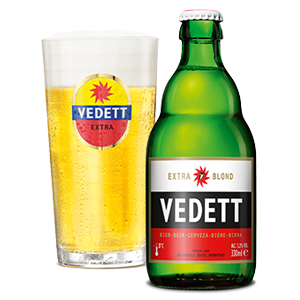 A naturally cloudy, refreshing, Belgian Wheat Beer. 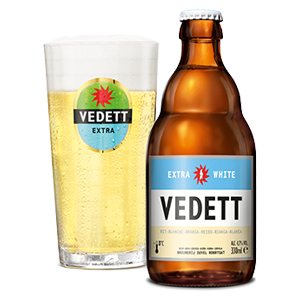 Vedett White is a perfect example of refreshment. Citrus-like and spicy aromas, with orange and touches of coriander standing out as the prevalent characters, make way to a wonderfully smooth, almost grainy, texture and slightly perfumed finish. The only thing left to do is enjoy another! Not really Indian, and not really a Pale Ale! 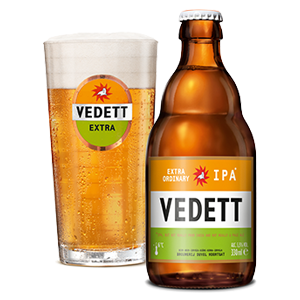 Vedett IPA is the ideal thirst-quencher that delivers an explosion of flavour. Fruity, floral notes make way to touches of caramel sweetness, while the brilliant bitter background grows in intensity with every sip. Fantastic smoothness, combined with a long lasting after taste, fulfill the taste buds long after each refreshing drink. A premium pilsner, which offers full-bodied refreshment from the first sip to the last. This blond has a great body and a pristine white head on her shoulders. Her extremely smooth, malty character is surpassed only by her tenacious fruitiness and delicate touches of vanilla. The intense carbonation gives a great mouthfeel and leaves a lasting impression after each and every meeting.